Game Informer has done a feature about the most notable news stories of 2004. EA's closure of Origin gets an acknowledgement. They talk a little bit about Westwood's similar demise and Richard Garriott's new work with NCsoft. 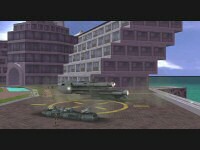 Since the Secret Ops site was taken offline, the only way that people have been able to get their downloaded copies of the game running is with a tool such as HCl's key generator. But it seems that it's still possible to get a registration code from the official site! Josh Bava noticed that the registration section is still available. 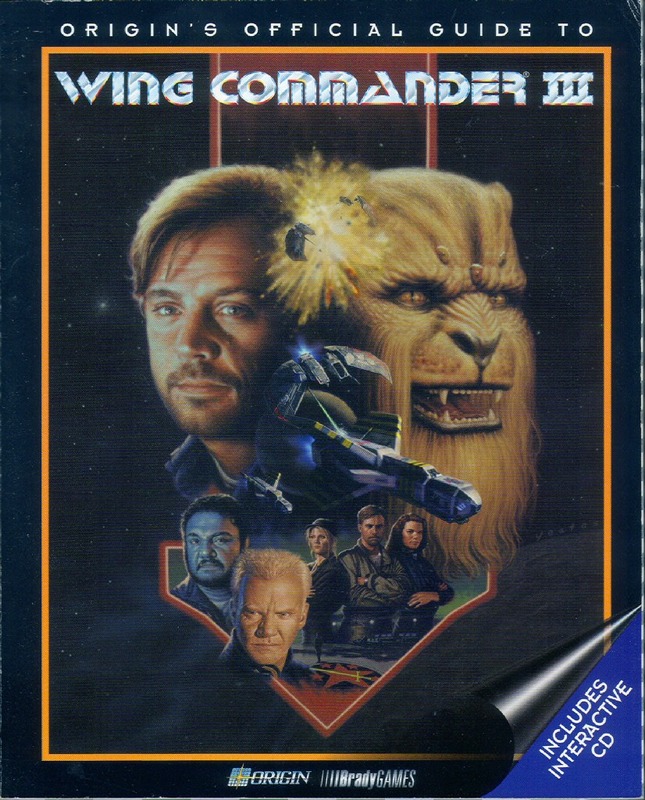 It's neat that an official Wing Commander thing still exists on the internet. When the original Wing Commander was released in 1990, it featured an easy to understand system of Space Forces ranks based on those used by the United States Air Force. When the series made the jump to full motion video, the rank insignia's changed to a series of geometric shapes -- and while the amazing Victory Streak manual gave a comprehensive inter-service rank chart, it did not provide an explanation of what the new symbols meant. 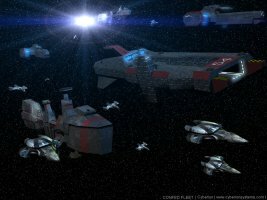 With that in mind, the CIC is proud to present an all new article collecting all available information on military ranks in the Wing Commander continuity! We've collected information and graphics relating to ranks from every branch of the service in both the 'talking head' and 'FMV' games... in addition to information on the systems used by factions like the Landreich, Border Worlds, Kilrathi and CIS. There's also some neat color scans from rare Japanese ports of the original Wing Commander, which show the original ranks in an unusual light. We hope that this will be a valuable reference for fans interested in writing fiction or adding background to their mods! (Special thanks to Halman, for helping to locate information from the novels!) You can find the ranks article here. If you have anything to add, contact us... we'd love to include it -- I'm sure there's a reference to a TCMC Lance Corporal somewhere! 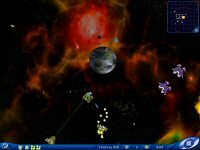 The Russian game publisher 1c is working with a developer named Crioland to produce Star Rush. 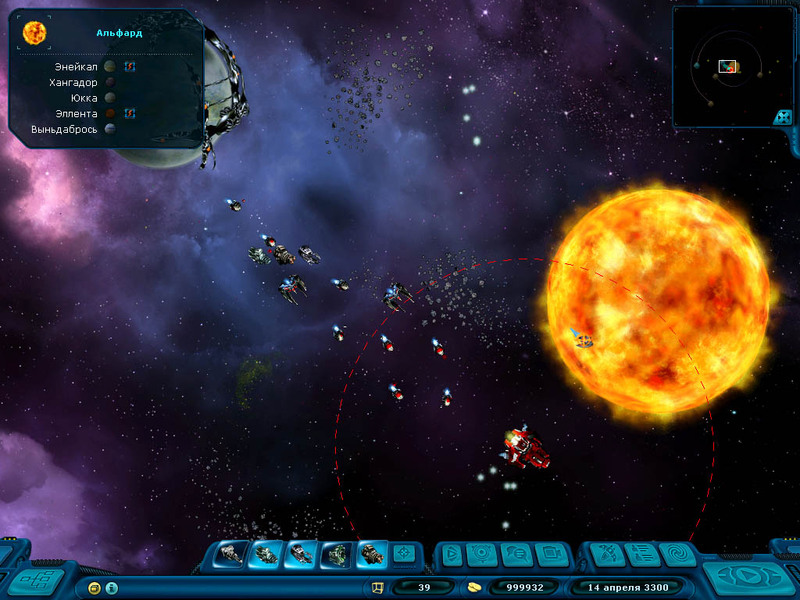 The game has the unique distinction of being set in a galaxy with parallels to the 19th Century American gold rush. Cyberion reports that it's based upon the Tomorrow - War novel trilogy, which is supposed to be a very good thing. 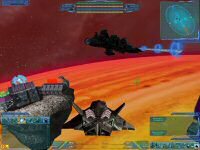 There will be a primary story with some free form play, and combat takes place both in space and during atmospheric scenes. 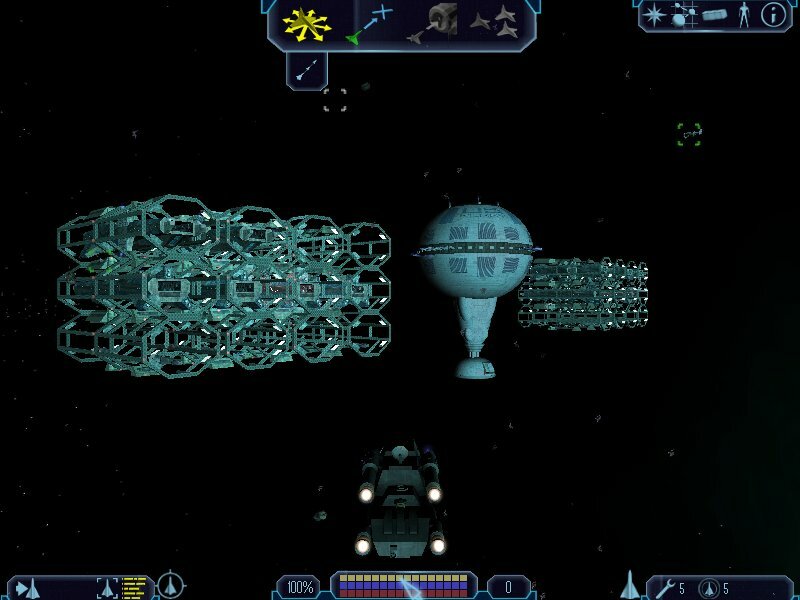 It's yet another Privateer style game with a lot of upgrades and space to explore. The HUD is actually quite a close copy of the Freelancer interface, although I haven't seen any note about joysticks yet. 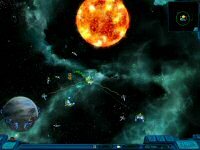 Star Rush is scheduled for release sometime this year. 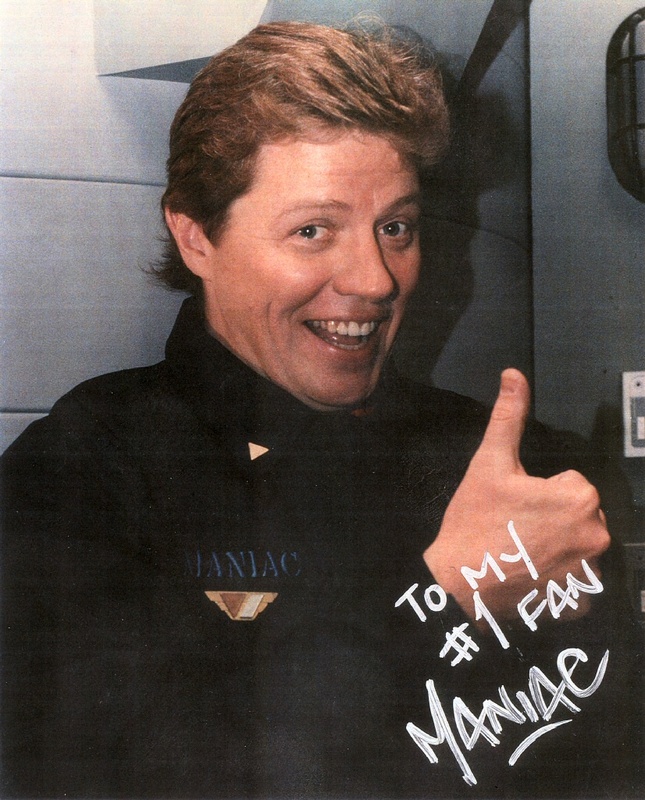 Stephen from BttF.com sent a note to let us know that Tom Wilson will be attending a Back to the Future encore presentation in Los Angeles, where he'll also take part in a Q&A session. You don't have much time left to book your ticket though, the event takes place this Tuesday, February 1. You can read all of the details here. Since the discovery of a further two Austrian comics last week, we've been confused about what the comics actually mean. Well, wonder no more as Starman has provided us with translations lovingly photoshopped over the original images. That's an interesting nurse they have there. 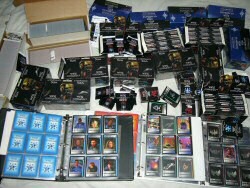 The last round of CCG trading was big success, so I thought I'd see if anyone else still has incomplete sets. With the notable exception of a number of glass prizes, most of the various physical shipment items that have been accumulating for the last several months have been taken care of. If you are missing a few cards, send us an email. This is just for trading to complete sets, not for people looking to start collecting. 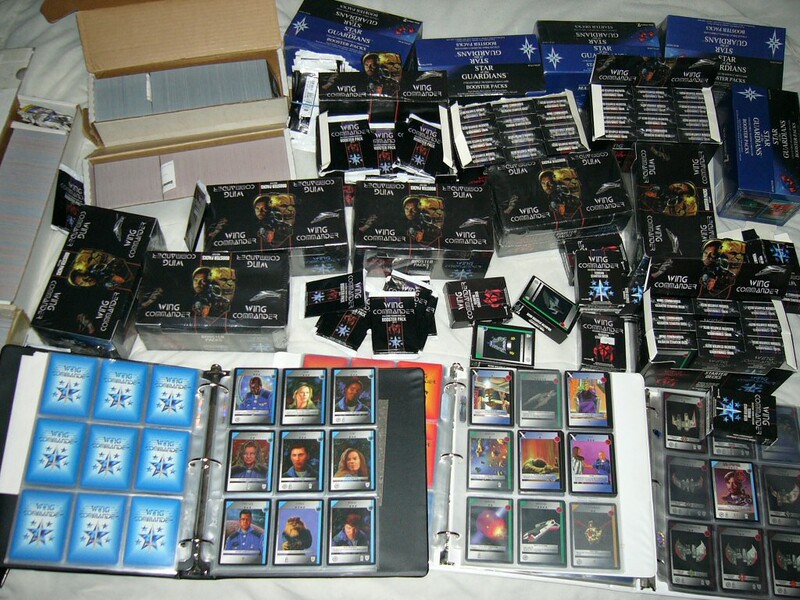 Any questions pertaining to the Wing Commander Customizable Card Game are welcome though. Continuing the interviews that began with Warren Spector last week, GameSpot asked Raph Koster about his ideas regarding 2004. Koster was a lead on Privateer Online at Origin. There's also a lot of games from past years that I am still playing--the Karaoke Revolution games are a hit with my daughter, so I end up playing those with her a bunch. Donkey Konga too, and I just got Taiko Drum Master, which is similar but different. As you can tell, I do a lot of "offbeat gaming." The inclusion of voice-over for non-player characters in Everquest 2 set, I think, a big new benchmark for MMORPGs. It really makes a difference. 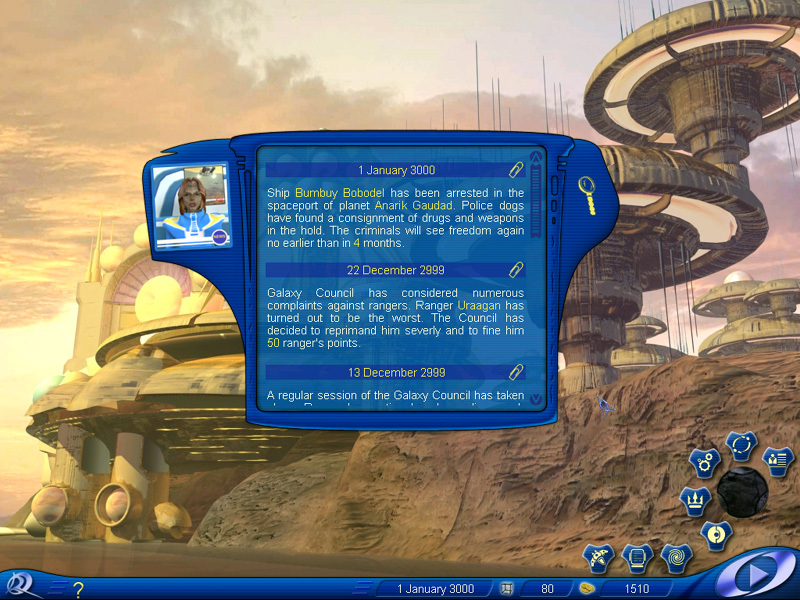 I think the [Star Wars Galaxies] Jump to Lightspeed expansion also set a new high watermark--I don't think any MMO has ever done such a massive addition to gameplay ever. It added a whole new way to play the game, and it melded twitch combat into an MMORPG. Donkey Konga's really great. You can find the complete article here. After a couple of months break to try his hand at projects such as wallpapers and websites, Cyberion has gone back to modeling ships. This time he has decided to show off his talents with a model of an Epee, but it's not what you think. This Epee is based on the Wing Commander Academy animated series design, which is a lot more boxy than its WC2 counterpart. 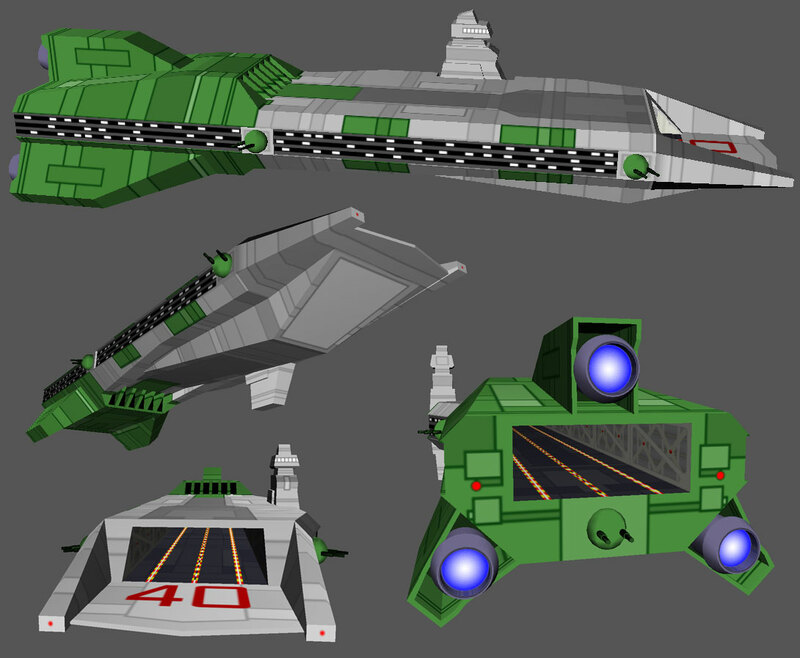 You can download the model in Lightwave format here. The third picture here is captured from WCA for comparison purposes. The actual design was made with the help of blueprints drawn by BradMick and LOAF. We've all cringed at really bad lines in movies. Most of us forget about them and move on, but MovieWavs prefers to record them and let people download them. The WC movie hasn't escaped their attention, and a small selection of quotes from the movie can be downloaded here. Now we can all relive the moment Maniac introduces himself to the Claw's rec room again and again! Shades has taken the time to help us update our Books Section. Although the page itself is basic and showing its age, the information listed there is still useful. You can find the titles and publishing information for most of the official guides and novels written in English. 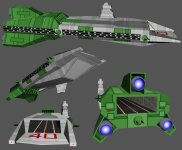 Each one of the items in the section adds new history and backstory to the Wing Commander universe. EGM/1up is reporting this morning that 50-70 people at the Los Angeles EA studio are being let go. 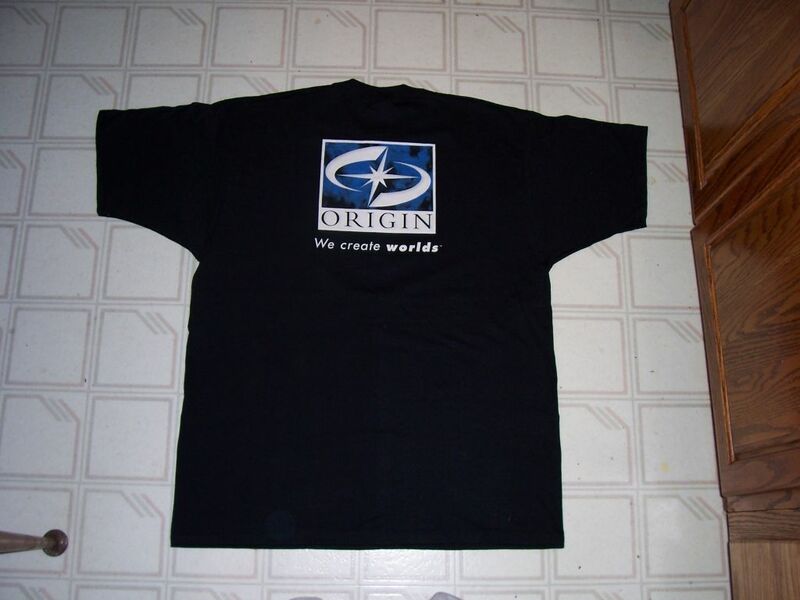 Although the rumor is that these people largely worked on the recent Goldeneye and upcoming Medal of Honor games, the Origin brand is also located at this complex. With new James Bond and Medal of Honor games scheduled for release later in 2005, these shake ups are a little mysterious. Edit: GameSpot confirms the news with new quotes from former-Origin and current-EALA general manager Neil Young. 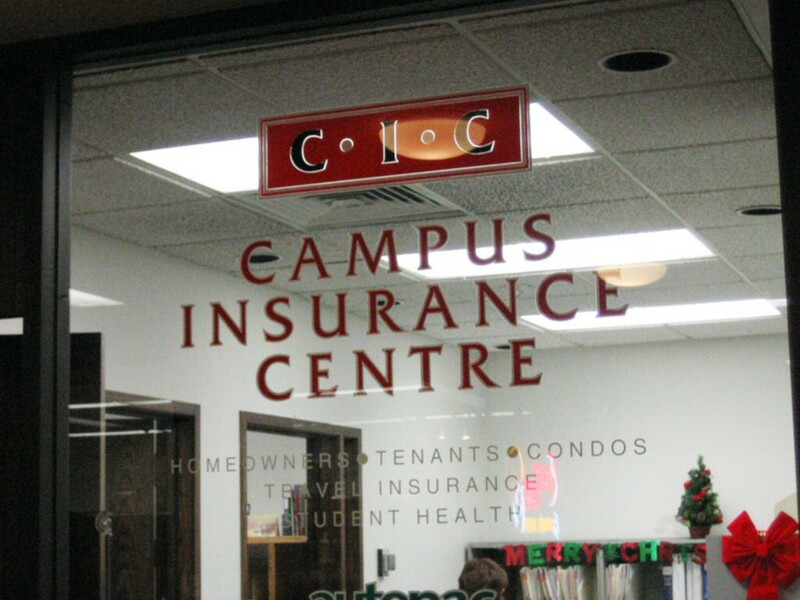 Here's a picture of the CIC Insurance Center at the University of Manitoba, thanks to Jibbo. 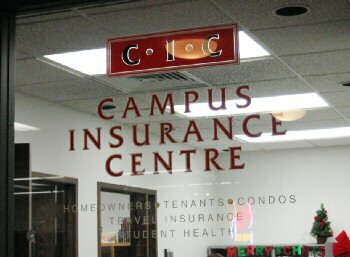 You can see it for yourself on campus in the Student Union Building. People seemed fairly interested in the autographed Tom Wilson picture we gave away at last year's Birthday Party, so here's the source image. This one has the basic Origin-inscribed autograph. A higher res one is available here. It might be suitable for printing. Although the final fiscal year tally is three months away, today's quarterly results are big because of the holiday season. For the quarter that ended December 31, EA's net revenue came in at US $1.4 billion, actually a 3% decline on last year. They had a dozen titles sell over a million copies during the quarter, bringing the number of platinum sellers in the year to 27. Need For Speed Underground 2, released just two months ago, has sold more than 8 million copies alone. Final year-end figures in March are expected to come in around $3.3 billion, which would represent a 10% total increase compared to 2003. Complete figures can be found here. In related news, to counter EA's recent exclusivity deals with the NFL and other sports authorities, Take Two has succeeded in signing a seven year exclusivity agreement with the MLB players union. Although there are some exceptions, this could essentially shut down EA's MVP baseball franchise beginning in 2006. GameSpot is carrying a story where EA's response calls this a "stupid money" expense. The recent flurry of sports exclusivity agreements would seem to be bad for the consumers, though each company's announcements have said exactly the opposite. Sega has sold off its Visual Concepts developer to Take 2 now, as it seems they are exiting the primary sports game business. EA also announced this morning they have completed an acquisition of Digital Illusions of Battlefield fame. Once again Cyberion has been busy in his workshop, and has produced this wallpaper depicting a wing of Banshees heading away from a planet. I assume there's a station or a carrier in the area since Banshees can't handle atmospheric flight. 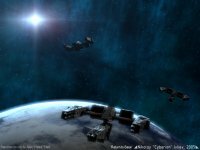 Over on the forums in this thread, the WC Universe project team have been wearing out their screenshot keys with a huge amount of publicity screenshots. Taken at 1600x1200 resolution with pretty much all details on maximum, they are perhaps the best quality screenshots we've seen yet from the project. Here's a sample of the first four, but for over a dozen more visit the screenshot thread. 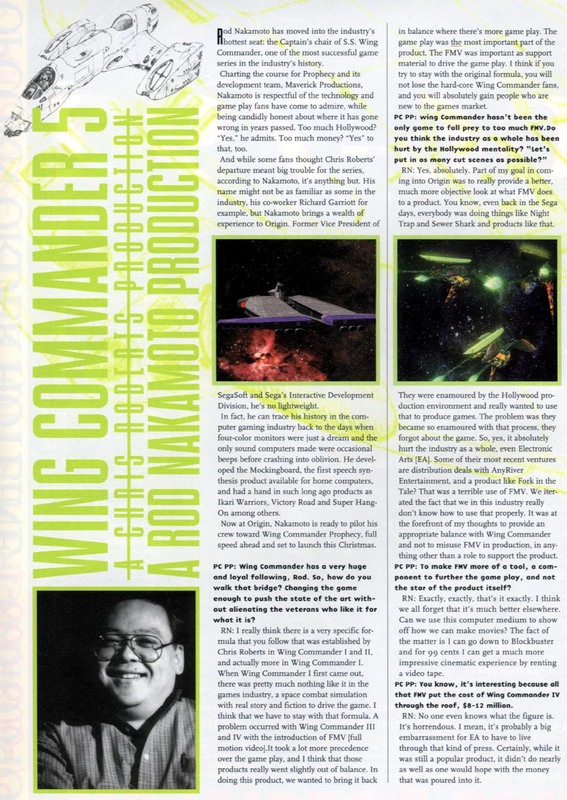 While digging through some of his old magazines, Duriel managed to find an interview with Prophecy's Executive Producer, Rod Nakamoto, inside issue #17 (October 1997) of PC Powerplay magazine. The interview goes in depth in to Prophecy's different uses of FMV and other aspects of Prophecy's development. 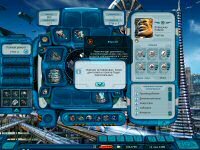 The multiplayer features which were sadly axed soon afterwards also get a brief mention. 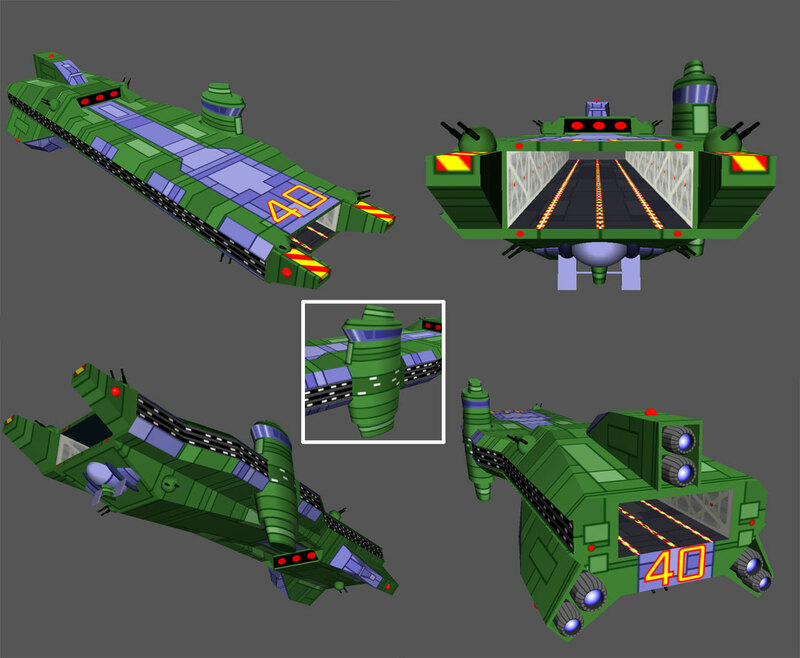 One of the things that is probably quite evident, especially in Wing Commander III and IV, is the way they designed it. They wrote the fiction, shot the movies and then they built the game. We did it completely the other way around. 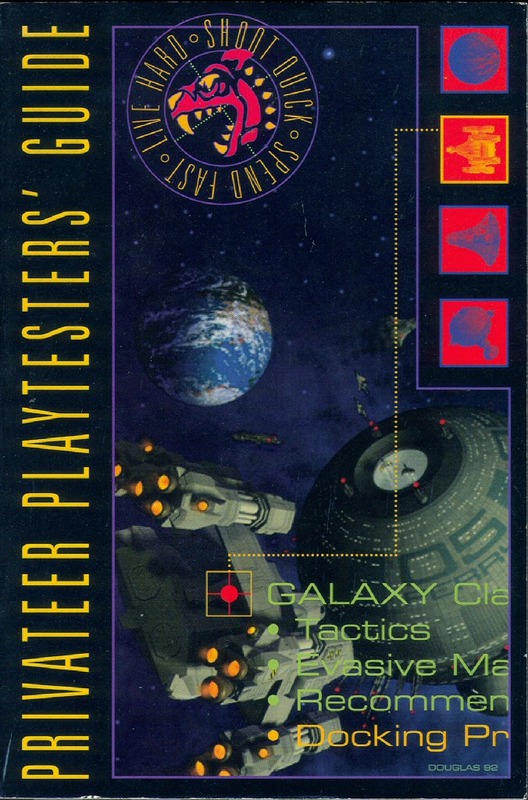 We designed the game, and made sure we had a core game that was absolutely fun and appropriate to the Wing Commander universe. Then we built the fiction to wrap around that core, and we shot the live production element to support that core. So, it was the other way around. The first thing we did was to design the game. It's January 23, so Happy Birthday Trelane! Yesterday was Hadrian's, and he asked me if his birthday wish for Tre arrived yet (three feet of snow across the entire Northeast), but I'm not sure. 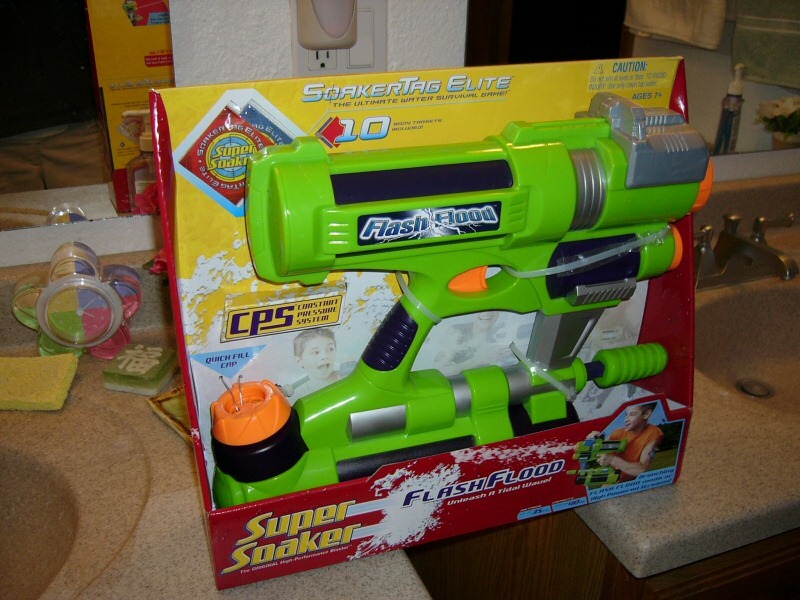 To coincide with the great weather this weekend (in Seattle, that is), today is a perfect day to show off my latest Super Soaker. The new 2005 models should be showing up all over in the coming weeks, if they're not already available. Target was the first place I saw them this year. You can find my review at Crius.net. 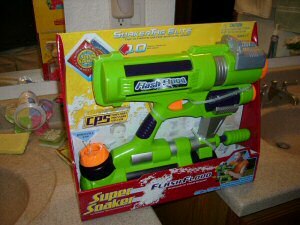 iSoaker.com is a good place to start if you're interested in miscellaneous Super Soaker research. There's some good news and some bad news regarding the strange Austrian comic we posted earlier this month. The good news is that Valkyrie has been able to translate the comic in to English. "Hey Jim, what do you think about some kind of vacation?" "Nice idea, I know a beautiful beach." The bad news is that it turns out that there are two more of these comics on the author's site that we don't have translations for. These look to be even more odd than the original and seem to feature a Vampire falling in love with a Panther. If you can shed any light on these strange developments, click the discuss link below and enlighten us! Choose Your Own Adventure is a subset of the fiction genre of books. CYOA reads like any ‘normal’ story, save for one extreme difference. At pivotal points throughout the book, readers are asked to choose amongst a set of decisions which will then impact how the rest of the story plays out. Due to the many different combinations of options, the books contain an enormous amount of longevity. The genre began as early as 1979, with the publication of “Choose Your Own Adventure #1 – The Cave of Time”. Skylark Publishers, now defunct, released over a decades worth of CYOA books, thus creating the blueprint for how the genre should be done. 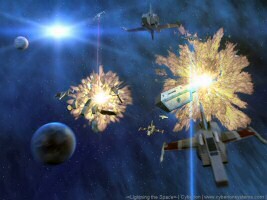 (http://www.gamebooks.org/cyoajr.htm) CYOA books continue to enjoy great success in today’s market. There hasn't been much progress recently, but it's a very interesting read if you're into the CYOA scene. 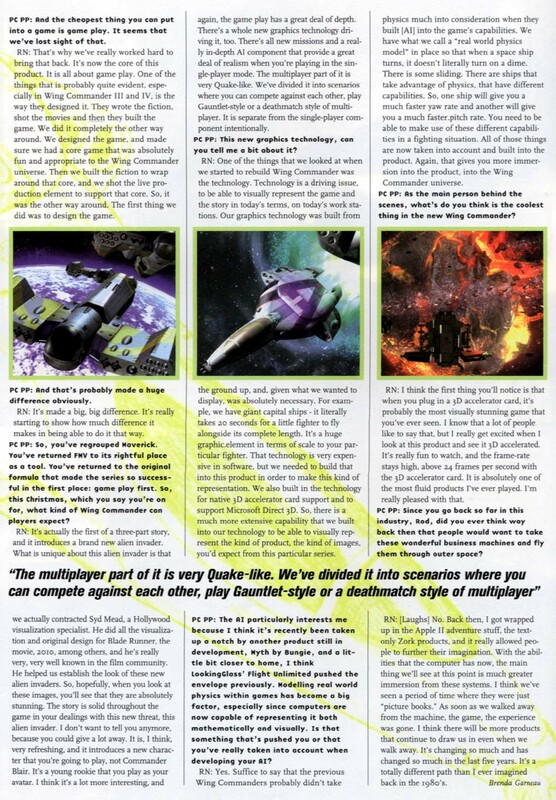 Cyberion has retrieved the Wing Commander 4 review for the fourth 1996 issue of the Russian SBG gaming magazine. We posted the cover of this one last year. Look at all the other classic games that shipped at the same time! Since the magazine is in Russian, the other pages have been zipped up for viewing here. The game received an 8 out of 10. It's always fun to see what former influencial Origin employes are doing today. Warren Spector pops up rather frequently. He always comes across as a really nice guy who is interested in communicating with fellow gamers. Spector served as a producer at Origin from 1989 through the mid 1990s. GameSpot and Salon recently asked him about his gaming and professional highlights for the last year. You know, it was just time to move on. I'm kind of driven by the "seven-year itch" and I'd done my seven years with Ion and Eidos. (Look at my resume--I spent seven years in grad school, six and a half in paper games with Steve Jackson Games and TSR, six and a half with Origin. It's a pattern!) I wanted to try new things, with new people, under different circumstances. And, frankly, Ion had gotten big enough that I was spending too much of my time running the studio and too little actually thinking about the games. Just time for a change. How do I feel? Weird, a little sad, and a little scared. The sad is because of all the great friends I'm leaving behind. The weird and scared? Well, that's exactly what I wanted to feel again, so it's all good. Marc got a lot of feedback on his original Bengal/Ranger hybrid, so he decided to implement a bunch of the suggestions. The changes to the design are fairly minor such as adding a texture to the sides of the flight deck but it all adds to the overall effect. I pretty mutch agreed with most of the comments and followed their suggestions, minor stuff really. We've said before it's an interesting design, and who knows, one day it may make its way in to a fan project. 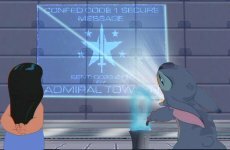 You can read the suggestions made by forums posters, or even suggest something yourself right here. 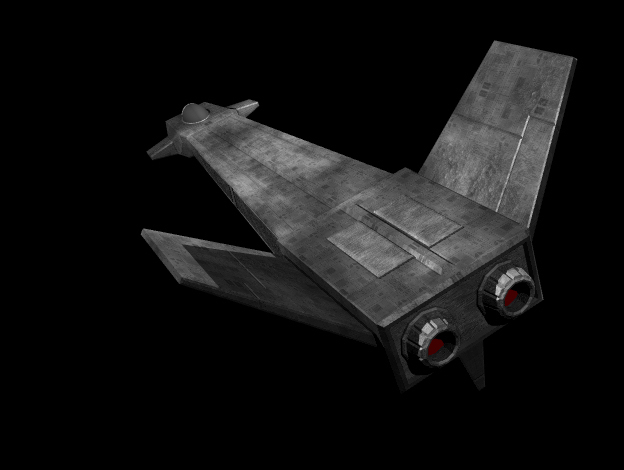 Our traditional New Years poll asks what kind of year you think it will be for Wing Commander. This year, more people than ever before voted Good or Great, beating Poor by a sizeable margin. 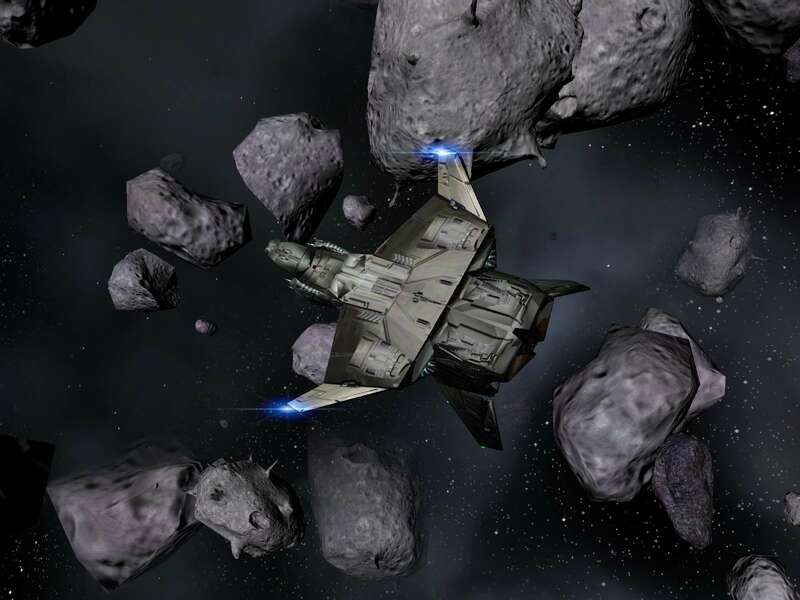 2004 saw Flight Commander and Standoff released, while WC Saga, Privateer Remake and The Reckoning continue to make progress. We thought now would be a good time to ask what setting you would prefer for any future project. The latest landscape for your desktops features a Cruiser going down while Hellcats ravage some escaping Razors. This one is a random scene, not part of the recent series of wallpapers for Holding the Line. It comes in at 1024x768 and 750 k.
We've cleaned up a couple sections today. Now would be a good time to help us update our general FAQ. Some of the more common questions have been answered there. If you think you share some lingering questions with others, follow the Contact link and let us know. In can often take us a few weeks to reply to normal email, so streamlining this process would be a big help. 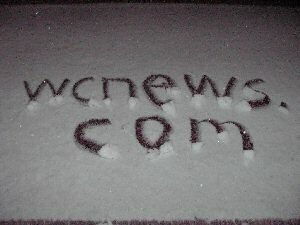 #Wingnut's cozy info page has also been updated with links to various past parties. It's been a busy week on irc, so now's a good time to drop by. Occasionally we'll see a project with a whole bunch of work already done appear out of nowhere, and this is one of them. 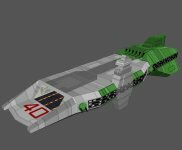 ZOmegaZ has posted version 0.5RC of a previously unknown project called PiArmada. 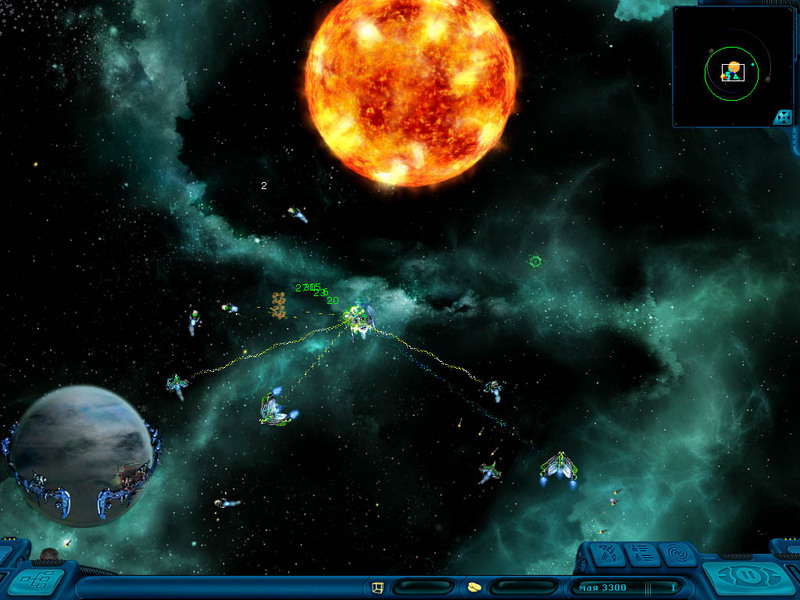 PiArmada is a project to recreate Armada in Windows, and a two player version of the strategy element of the game is already complete. The project is by no means complete, and we look forward to seeing this one's progress, but for now you can download version 0.5RC here, and you can find the instructions and post your feedback here. 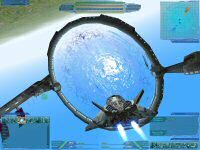 Code: PiArmada will eventually implement a cleaner and more detailed interface, saved games, AI players, internet play, and integrated flight simulation with an existing open-source engine. 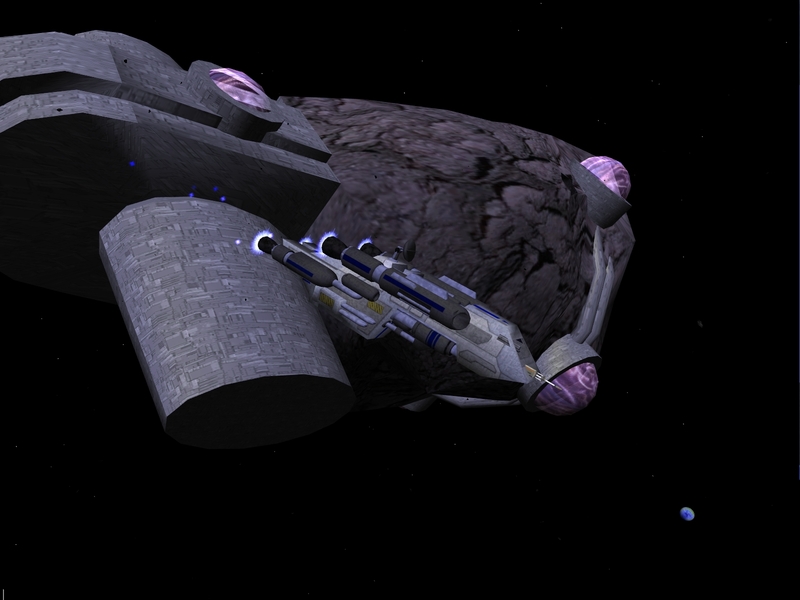 Further extensions beyond the original Armada are definitely in mind, but not so clearly defined as yet. Ideas can be posted at Sourceforge. All the code is currently in Python. Anyone interested, say the word, sign up at the above site! 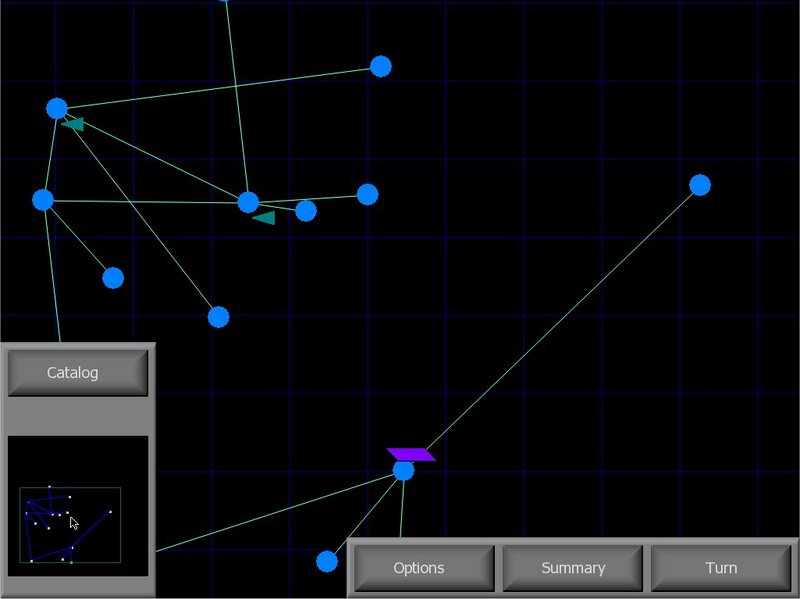 Graphics: New interface graphics are needed, as most of the ones we have now are made by me in about twelve seconds. Bob McDob made the sector level buttons and button backgrounds, which is why they look so much better than everything else! All graphics are in .PNG format, and exist in a separate, easily accessable folder included with the distribution download. If you want to redraw something, redraw it and send it in! It's that simple. More planet images would be especially nice, since I really don't know where I got the one I have, and the owner might well object for all I know. Sound: PiArmada is now completely silent. Something as simple as button clicks would be wonderful, and any other interface sounds you think appropriate. Background music is also needed, so if you know of anything appropriate that is legally distributable, or can write anything, let us know. 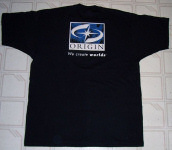 Cyberion has posted an article from the Russian digital magazine SBG which goes in depth in to the history of Origin Systems up until 1997 when the article was published. Being a Russian magazine, it is of course in Russian, though they have kindly highlighted in yellow anything that English speakers will be able to understand, although that's mainly product names. Russia actually has a surprisingly large WC following, and fan site WC in Russia won our fan site of the year award multiple times. You can view the article on Cyberion's site here. Warzog and the Privateer Reckoning team have released the latest version of the Freelancer Wing Commander mod. It's looking better than ever. The shot featuring the carrier hanging in space below is just gorgeous. 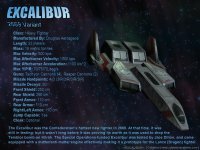 You do need the full retail Freelancer and the Freelancer Mod Manager program, which you can download here. Don't forget to disable your other mods when you load up The Reckoning. The mod files clock in at about 27 megabytes. That package can be found here. The past 24 hours have been a great time for Clive Owen, who is best known in WC circles as Ser Lev Arris from Privateer 2. He has not only been awarded a Golden Globe award for best supporting actor in recognition of his performance in Closer, but has also been nominated for the best supporting actor award at next month's Bafta film awards. He also stands a good chance of being nominated for a best supporting actor Oscar. All that isn't bad for a guy who eight years ago spent all of his time hanging around Sinners Inn. The Baftas will be awarded on February 12. The BBC has a good write-up about Owen. They also comment that his recent success will improve his chances of becoming the next James Bond. The latest news regarding EA's moves in the football gaming industry came out this morning. Not content to simply strip away the NFL license from competitor Sega ESPN NFL 2K5, they have now licensed the use of the ESPN brand for fifteen years in all relevant areas. In gaming time, fifteen years is an eternity. They already outfoxed Sega last year by snapping up ESPN tv deals while Sega games carried the ESPN branding. All of this would seem to give EA the ability to price football and other sports games at will moving into the next console generation in 2006. "This relationship was created to benefit consumers who are passionate about sports games," said Larry Probst, Electronic Arts Chairman and CEO. "EA SPORTS recreates the real life experience fans enjoy while watching or playing their favorite sport; while ESPN programming captures the look, sound and excitement of the sports they follow. Together, we believe we can significantly grow the interactive sports category." Siberian Tiger has released a Steam skin for players of Half-Life 2 and related games. It contains a handful of files to unzip to your Steam area. The package is only about 180 k. You can grab it here. 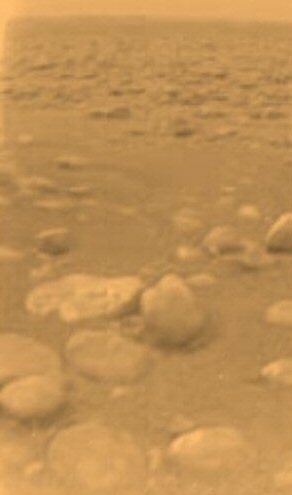 It's not every day that we have new photographs from the surface of another planet, so today here are a few shots from Titan. Shot three is the first color shot from the surface, featuring a number of small rocky blocks of ice or another substance. 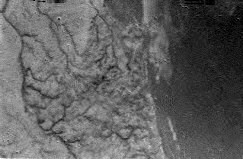 The other two are aerial shots showing what could be a coast and streams of liquid methane. 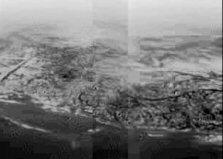 You can find more shots and descriptions of the Cassini-Huygens probe here. Last month we brought you an article from the August 1999 (#54) issue of SFX, which was about a visit to the set of the WC movie. Now we have scans from the August 1998 (#41) issue which contained an early preview of the movie. Throughout they seem to be under the impression that Matthew Lillard plays Blair, but otherwise it's a very interesting read. The full size scans range from 1.5MB to 2.3MB each, so it may take a little while to view them. Incidentally, the update mentioning that this issue is on sale was one of our very first updates on the CIC's launch day. What a great day that was. Raptor has sent through the first HTL chapter of 2005, and it sounds unsuitable for children. I'll let Raptor explain. I believe you should always start a new year the way you mean to carry it on. In that vein, the first chapter of HTL's sixth and final year is a brutal and blood soaked tale. This chapter is an interlude to our current story, and is set parallel to the fighting in Loki. It tells the story of the blood feud between the Tanfen Corporation and its arch rival Porhen Industries. This story is written by Kevin "Leeloo" Tan. Please send any and all comments to Kevin at leeloo8@hotmail.com, not to me. Cyberion posted a note saying that an unused archive in yesterday's Pure DOS package was infected with some sort of malicious code. The file in question was not actually used in the execution of his program, but to be safe, he has reuploaded a cleaned version. You may want to run a local virus scan if you used this program, but even if you did, it's unlikely that anything got out. You can find Cyberion's full post here. I recommend Free AVG. In the later 1990s Wing Commander fans hit a point where their computers were too fast to play Wing Commander 1 and they no longer had a formal DOS operating system to play Privateer and Armada. Prices of the Windows native Kilrathi Saga soared and fewer people played some of the other games. In the last year or two many new solutions have been discovered to correct this devastating phenomenon however. 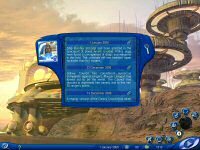 Many people have used moslo or myJemm, but computers keep getting faster and myJemm will not run in Windows XP. 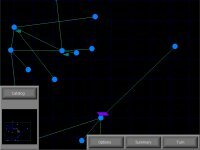 We've reported about Abandon Loader, VDMSound and DOSBox in the past, but recent improvements have added stability and flexibility to these programs. Here's an intro to the latest version of DOSBox. All of the screenshots below were taken in version 0.63. With a little bit of help, running the original Wing Commander games in Windows can be easy. 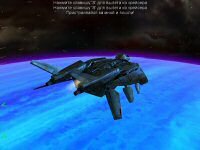 DOSBox speed limits Wing Commander 1, allows Priv/Armada to execute in Windows and adds support for USB joysticks to the older games, among other things. When you load the program, you're presented with a Z drive dos interface. 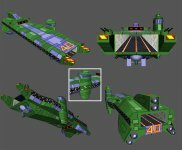 If you have Wing Commander games already copied to a hard drive directory, type "mount c: c:\wingcommander" where c:\wingcommander is the directory of your game. Typing in "c:" will now take you to a C prompt where you can type the name of the executable or install file for your game. You may need to go into the installation menu to setup sound and music. DOSBox defaults the sound card's IRQ to 7. Some games will run just from there. USB joystick support is automatic and EMS support is on by default. Some games, such as Privateer and Armada, need EMS to be disabled. DOSBox will install a dosbox.conf file. You can open this up and change "ems=true" to false to turn off EMS. Additionally, some games may need an additional entry to execute. 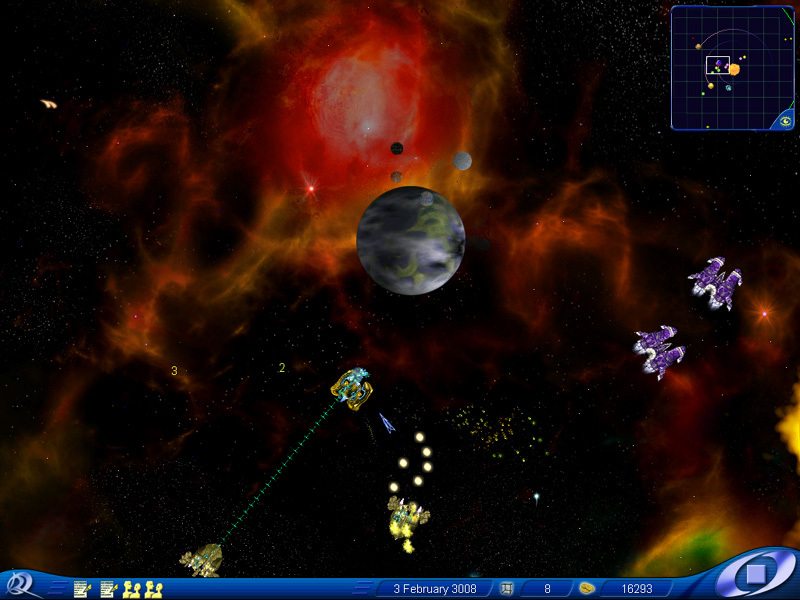 Privateer and Armada run well with "loadfix -65" typed before the game's main executable (for example "loadfix -65 armada"). The -65 is optional and variable, but we've had best luck with that value. 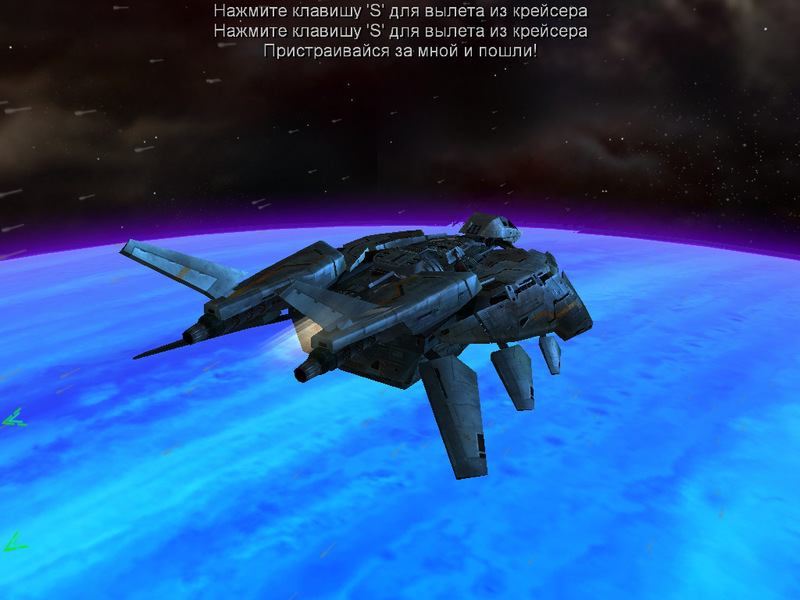 Wing Commander 2 will also probably require "loadfix -32 WC2" to avoid some freezing a couple missions into the game. Joystick and sound support may be glitchy depending on your hardware. In this case it can be difficult to get them to play smoothly. You can play with the CPU/frame rate options with Control+F7/F8 and Control+F11/F12. The game defaults to a 3000 cpu cycle speed. Games such as Armada will play best in the 6500 range (hit Control+F12 several times). The above instructions will sound rather complicated if you've never used DOS before. Click the "discuss" link below or stop by #Wingnut and someone may be available to give you more specific instructions. 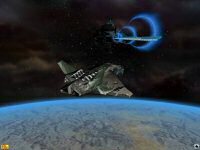 No old Wing Commander games? 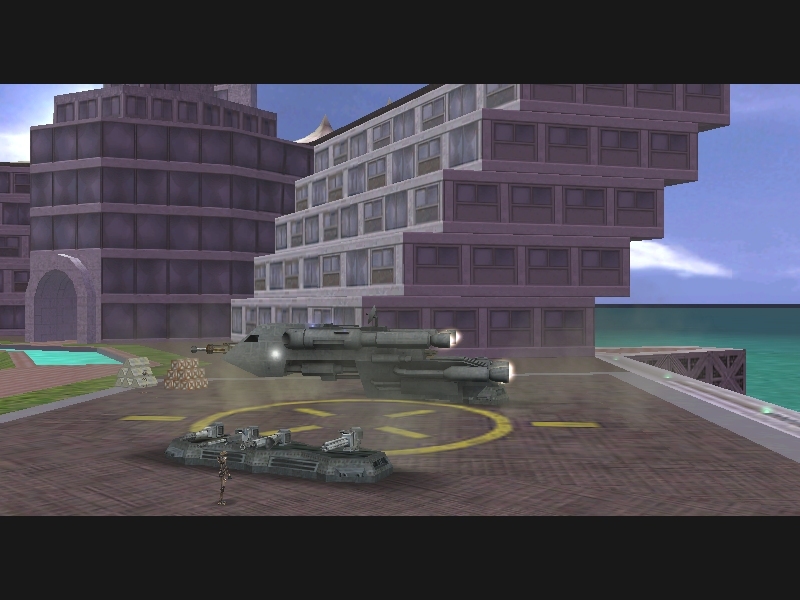 One of the screenshots above look unfamiliar? Head to eBay and Half.com! Edit: Eddie pointed out that D-Fend is a good graphical interface that lays on top of DOSBox for easier configuration. Edit 2: Some people have had some difficulty installing games. The solution for this varies widely depending on the game and format. In some cases, simply copying over files from the CD will do the trick. In others, you may have to do a more complicated DOSBox mount to tell it where to find your installation discs. An easier way to do this is to copy discs to the hard drive and map your DOSBox prompt there. Edit 2.5: There's an easy way to trick WC2's installer. Just copy over all the files and create a WC2.cfg file in the WC2 folder. Then go into the installation program and the game will skip straight to the sound configuration settings. Cyberion has also been working on ways to get older Origin games to run. 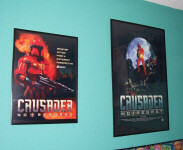 Citing some instability between DOSBox and Crusader, he has released the DOS Environment Package. It takes a different approach by attempting to reboot your modern computer in DOS mode with support for sound, video and accessories. He has tweaked the program quite a bit over the last week. Check it out here. It's yet another exciting way to bring all those great Origin games into the present day. Meson would be angry if I didn't mention that the Cassini-Huygens probe will be making planetfall on Titan tonight. The party is around 3 AM Eastern US time. Some of us will be up in #Wingnut to see if it goes successfully. Official NASA coverage can be found here. There'll be some sort of webcast here. 01.13.05 - Mission managers for the European Space Agency's Huygens probe said the spacecraft is on course for its descent to Saturn's mysterious moon Titan on Friday, Jan. 14. The probe, which detached from NASA's Cassini orbiter last month, will be the first object to explore on-site the unique environment of Titan, whose chemistry is thought to be very similar to that of early Earth, before life formed. The data gathered during the probe's 2 1/2 hour descent through Titan's atmosphere will be transmitted from the probe to the Cassini orbiter and then back to Earth. Long time Origin composer George Oldziey has released a number of new tracks from his upcoming game, Shaiya. They're not just selections from a new game though. 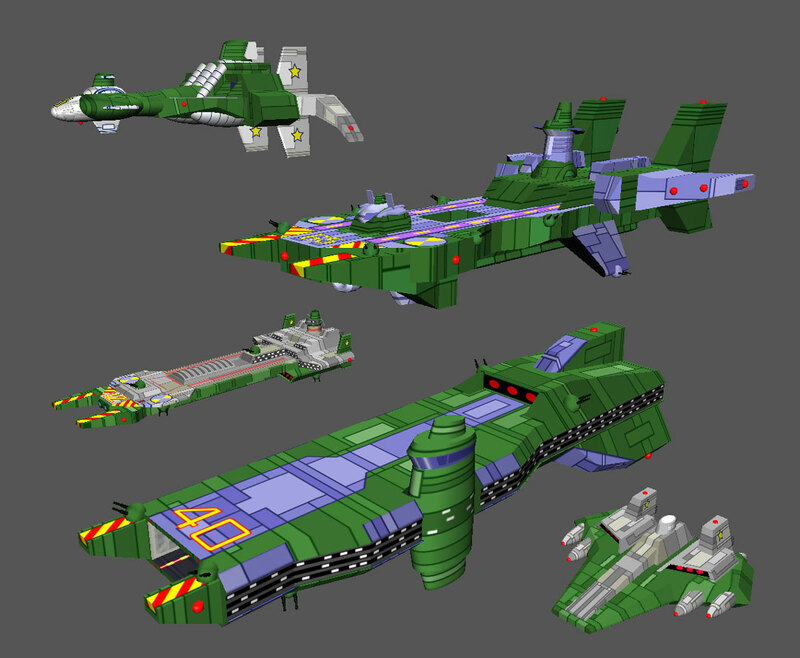 There are very distinct Wing Commander influences throughout these samples. It's quite interesting to hear the variations and evolutions of the songs today. It's great to hear that Mr. Oldziey is getting to do some cool things these days, and his suggestion for matching up Shaiya to Wing Commander tracks sounds like fun. To take a little load off some of his bandwidth, we've mirrored Battle Full Mix. 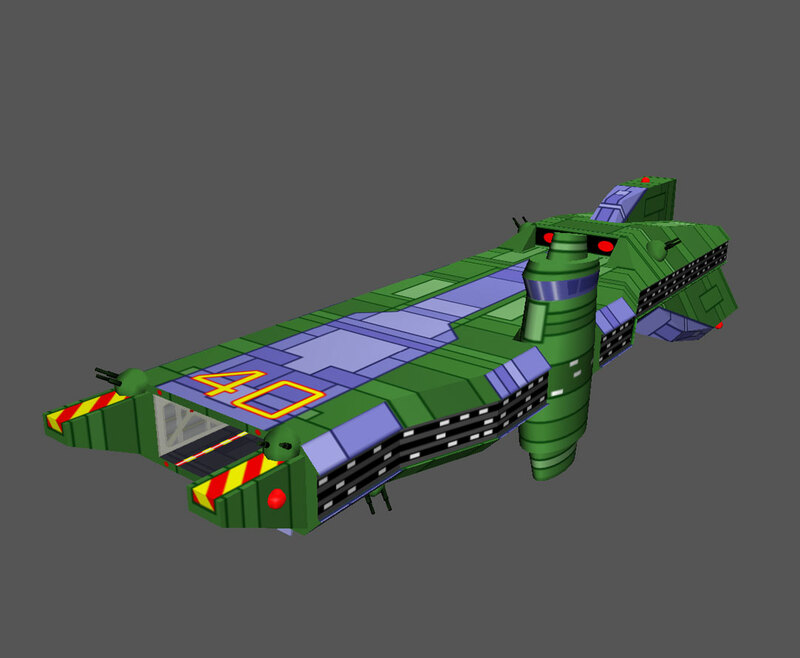 This one should be quite easy to match up in Wing Commander. Hit the "Discuss" button below if you think you know where other tracks were inspired from. You can find his other samples here. 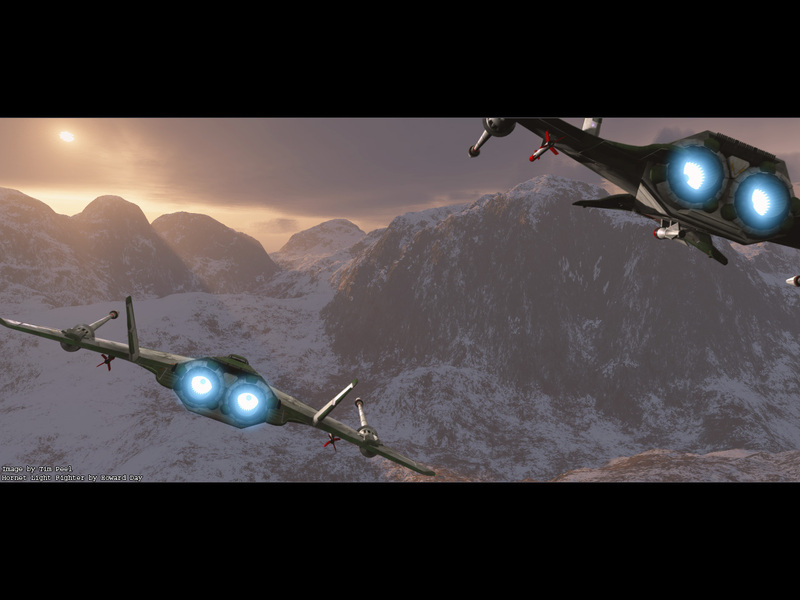 Tim Peel was playing around with the Hornet model created by Howard Day and created this scene showing a pair of Hornets flying towards the sunset. It was created as just a piece of art, but I think it would fit well as a wallpaper. I think there's a pretty good amount of fan art around actually, but more is always welcome. You can see more of Tim's art at his site. It has been over half a year since we last heard from Heart of the Tiger, but now he's back with his own particular flavor of insanity.. in triplicate! 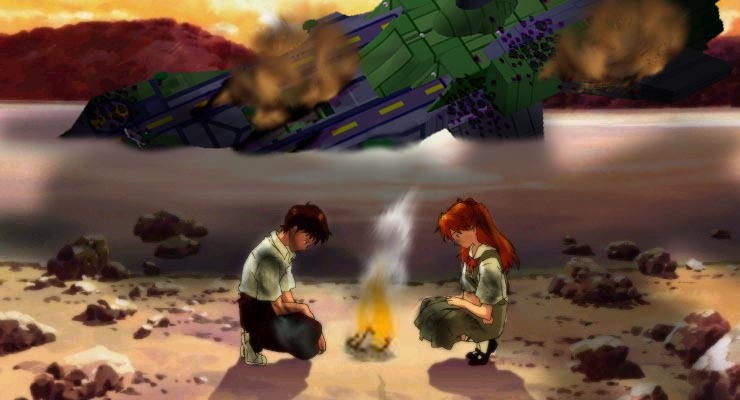 First up is a picture of a wrecked Concordia transplanted in to a scene from "Evangelion." It does look a bit like Vespus though. Next up, he decided that it's about time that Lilo and Stitch received a code 1 secure message from Admiral Tolwyn. Finally HoTT decided that Sosa would look better dressed as Belldandy from "Ah, My Goddess!" Panther looks just as confused about it as I am, although these are mild compared with some of his other works. As strange as it may seem, it's good to have him back. 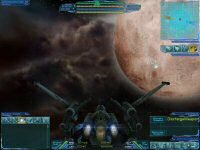 Another project that has been idle for some time is the Macross: Do You Remember Love mod for Secret Ops, but they're still making progress. 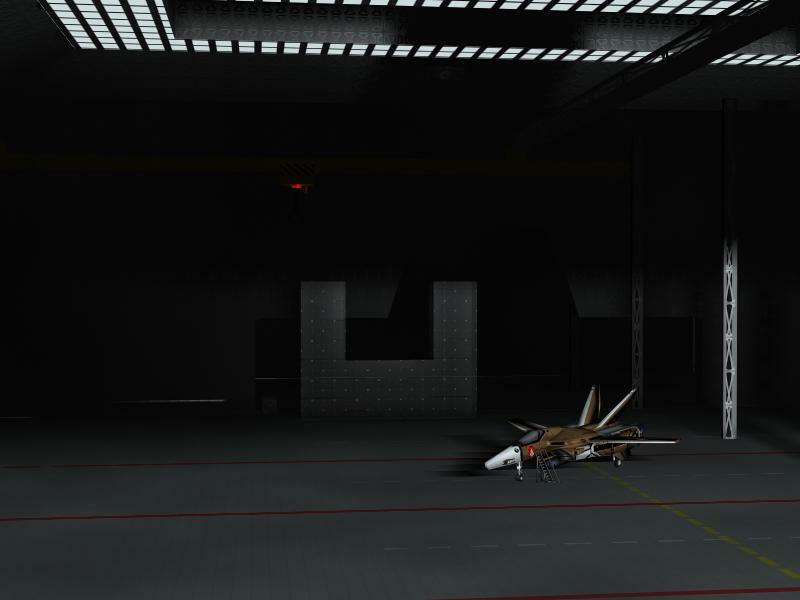 Blackwolf has been showing off his new hangar deck. It's still work-in-progress, but it looks to be shaping up nicely. Blackwolf has asked for suggestions which you can post here. It's already been a busy year for Cyberion, and we're only ten days into it! 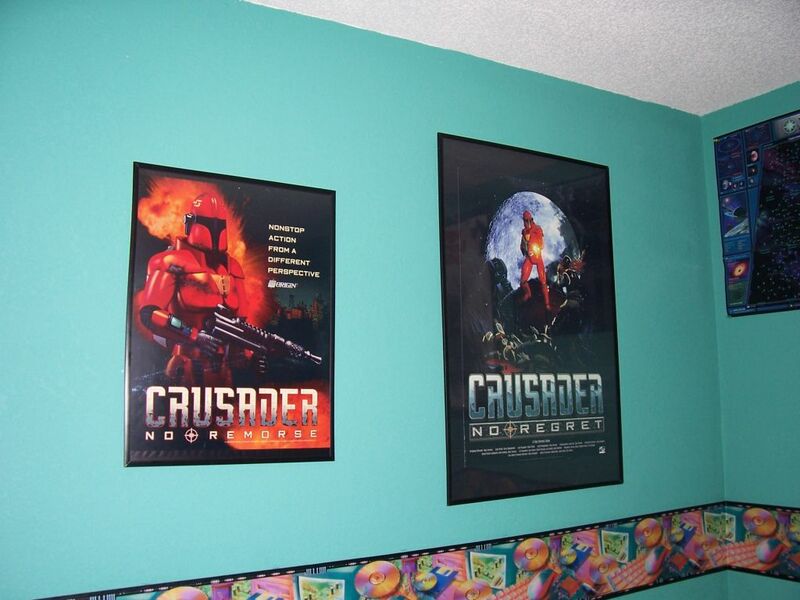 His latest project is a tribute to the many games that Origin has made over the years. 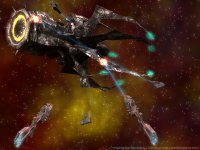 We're all familiar with the Wing Commanders, Ultimas and Crusaders, but Cyberion's memorial lists everything from 2400 AD to Wings of Glory. There's also a little bit about the major project developers that worked for the company over the years. It's just in the beginning stages, and he's looking for feedback about the sort of things that would be appropriate to add. Box scans, system requirements and other information would also be helpful. I've decided to create a special corner for this company as my sign of sincere gratitude for the things and games they made. 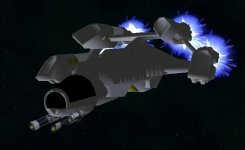 The Privateer Remake Team is trying to determine what size packages would best suit people interested in the upcoming fan project. They've taken some liberties with the scope of the game, beefed up the graphics and recorded new audio, so the release will be slightly bigger than the original. They have come up with four release scenarios ranging from 80 megs to 165 megs of required materials. You can let the team know whether you prefer to download individual components or get the release as one intact package. As someone who downloaded the full Secret Ops package on day one with my trusty 33.6 modem, it's a pretty easy choice for me. You can add your opinions here. 12 o'Clock Mike has made a Flash animation for a computer art class. 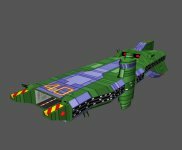 It's pretty cute and sums up the classic Wing Commander experience well. You can find it here. Instead of doing just a simple animation doing the bare minimum, I wanted to do more. I wanted to a movie. 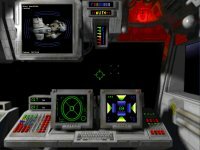 About WING COMMANDER! 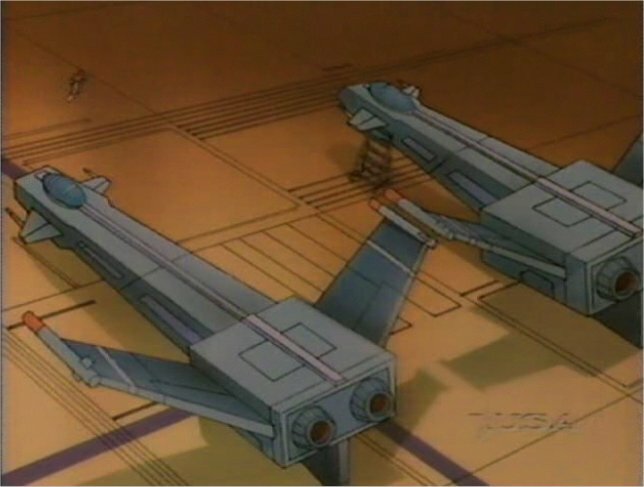 But it was alot of work trying to draw and animate flight choreography. I just did what Chris Roberts did: do different view perspectives and change them to make a movement... I hope you like it. Be patient. There's about a minute of intro text before the action starts. We've mirrored the file here in case Mike has limited bandwidth. The main criticism received by the original version of the Standoff overture was that it sounded a little too much like a MIDI. Now Standoff's composer Needaham45 is looking for feedback on a new version. This piece is the same tune as the original, but the instruments have been replaced by higher quality sounds. Well, with the holiday season over and some money I picked up, this year, I decided that I would invest in a new sound set in order to try to improve the quality of the rendering that you hear. I've looked into a few programs and tried a demo or two, and I did a re-rendering of the Standoff Overture. The sample of this program didn't come with every sound (as it was a sample), so the pitched percussion (glockenspiel, chimes, and timpani) as well as two guitars (distorted electric and nylon acoustic) are still remaining from the old sound set. However, all other instruments have been replaced by instruments from the new sound set. I did not change any dynamics to accomidate the new sound set either, so some balance things are a little off too (especially the end... the drums are uncontrollable now... I'll fix that if I go with this sound set). For all of you who are interested, please listen to this new version, and leave a note/vote and tell me what you think so I know whether or not you, as the listeners think this is a worthy investment. The place for your feedback is right here. Cyberion can't have had time to rest, as since we last checked up on him only a few days ago, he has produced two new WC wallpapers. 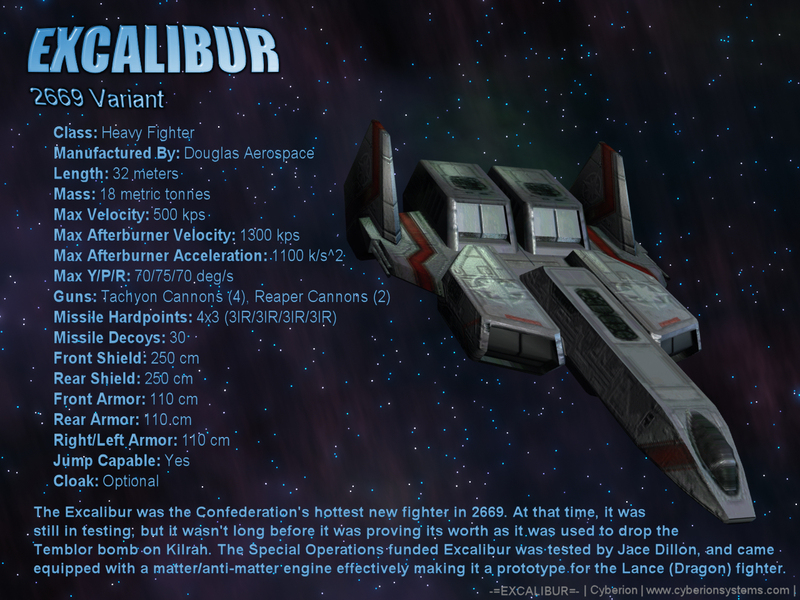 The first one takes a nice render of an Excalibur and puts a complete list of statistics next to it. The second picture is a great action shot of a Tiamat class dreadnought being taken out by three Murphy class destroyers and a pair of Plunkett class cruisers. The problem is: which one should I set as my desktop wallpaper? This piece of art found here provokes so many questions - What is a Vampire and a Wasp doing out in the middle nowhere? Where did they get the deckchairs from? What happened to the Wasp's booster pack? Why did someone create this? Oh, and what the heck is actually going on here? I'll let you use your own imaginations to decide what this is all about, but chances are you'll be completely wrong. 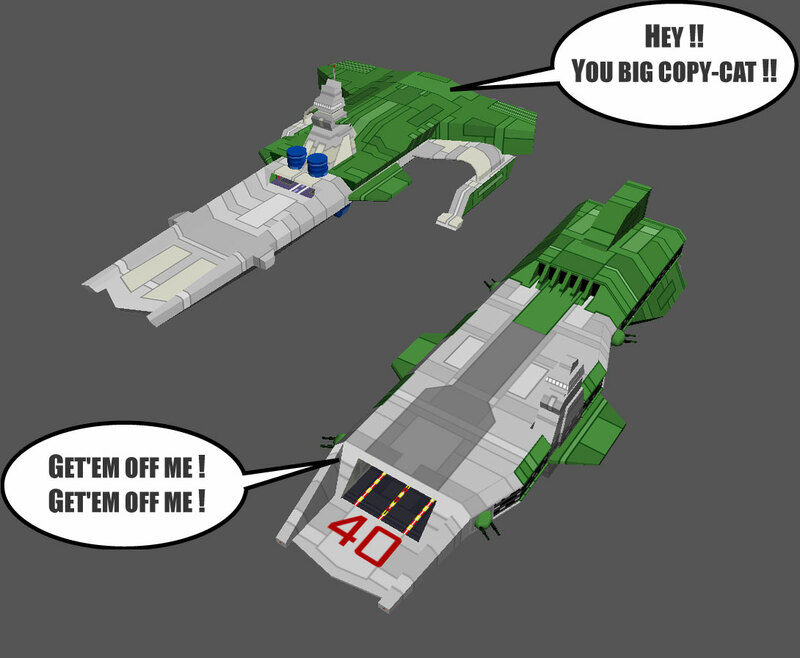 Last month Marc sent us an interesting ship design based on a Bengal/Ranger hybrid. Expanding on that theme, he has taken the next logical step and put the Ranger in the Wing Commander 2 era. I like almost everything about this one. It looks like a big toy. That's the same feeling I get from all the WC2 designs. I like everything EXCEPT those three damned red dots on the engine intakes, but I've tried many alternatives and those dots are the best of a bad lot. It actually looks right at home with the rest of the fleet... see for yourself. 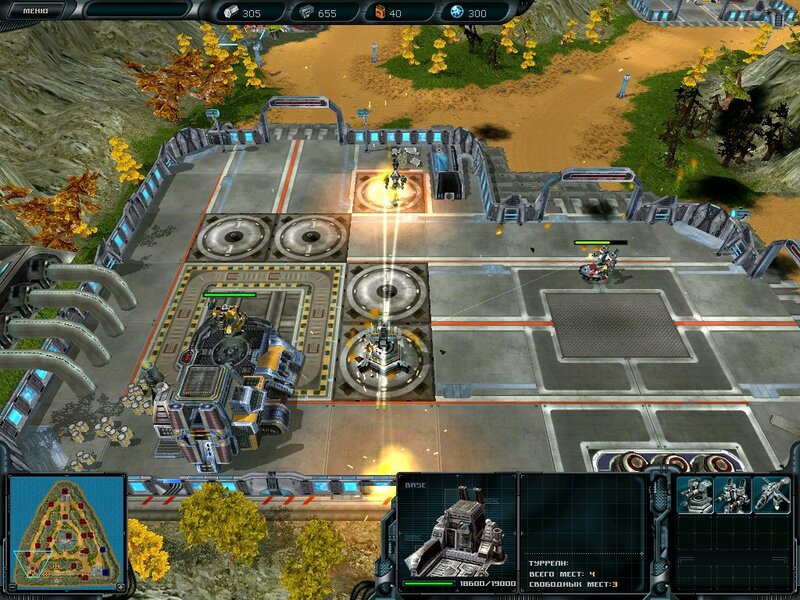 Cyberion has been swearing that Space Rangers is an amazing game since its Russian release in November. It will get an English launch in April, so the rest of the work can take a peek. The game is a mix of several different styles. 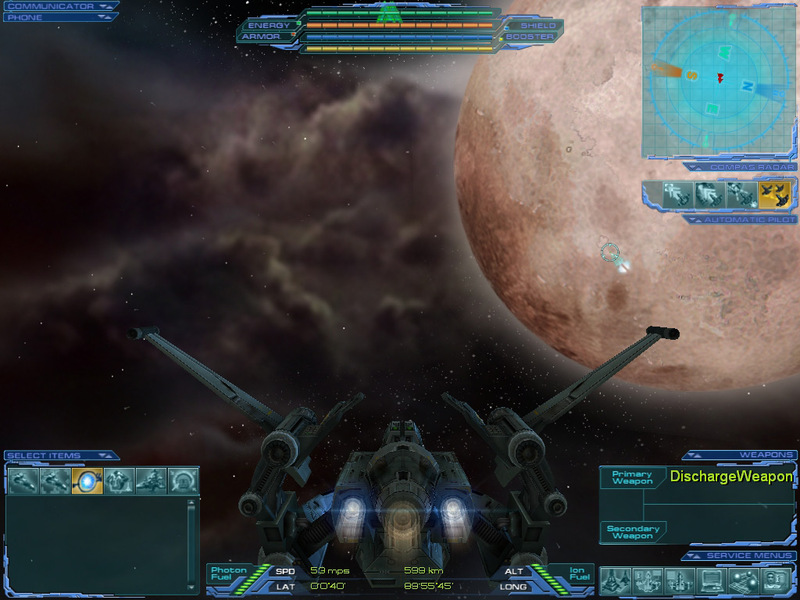 It's a turn based 2D space sim with Privateer and RPG aspects. There is a very large universe to explore and a lot of freedom of choice. 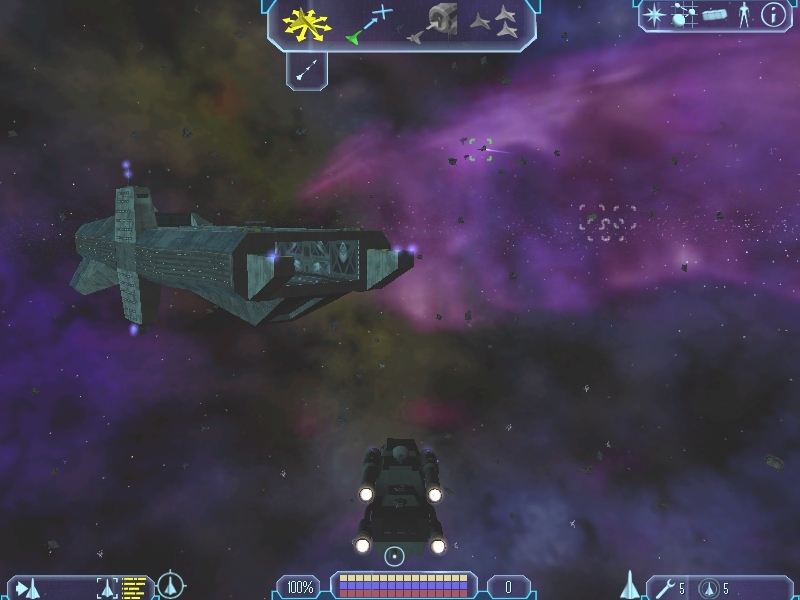 The individual characters have stats which evolve over time and the ships can be modified and improved upon. 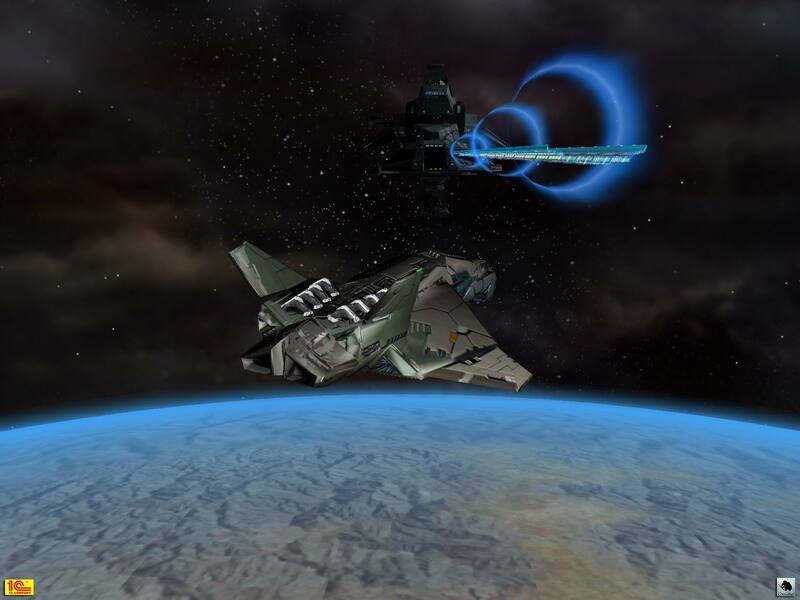 There is plenty of space action, but various quests and missions can take you planetside. An English page with comprehensive information on the game has been set up here. It sounds like the universe Space Rangers takes place in will be sufficiently complex with dynamic events happening with and without your input. Rangers essentially act as Privateers against an invading alien menace. The upcoming English release will feature both Space Rangers 1 & 2 in a special package. Continuing his work for Holding The Line, Cyberion has released his second wallpaper based on a battle scene from one of the fan fiction project's chapters. The scene shows a nice big Confed fleet heading off somewhere. Pretty cool. The full image weighs in at about 1.2MB. You can find the first HTL inspired wallpaper here, and more of Cyberion's work in his gallery. 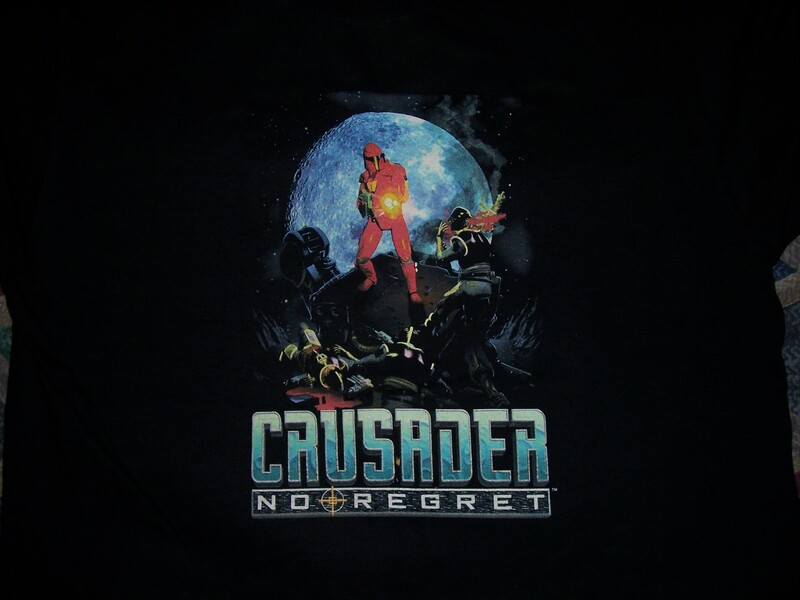 ZFGokuSSJ1 put together a few shots of some interesting Crusader merchandise with Origin veteran Mark Vittek. 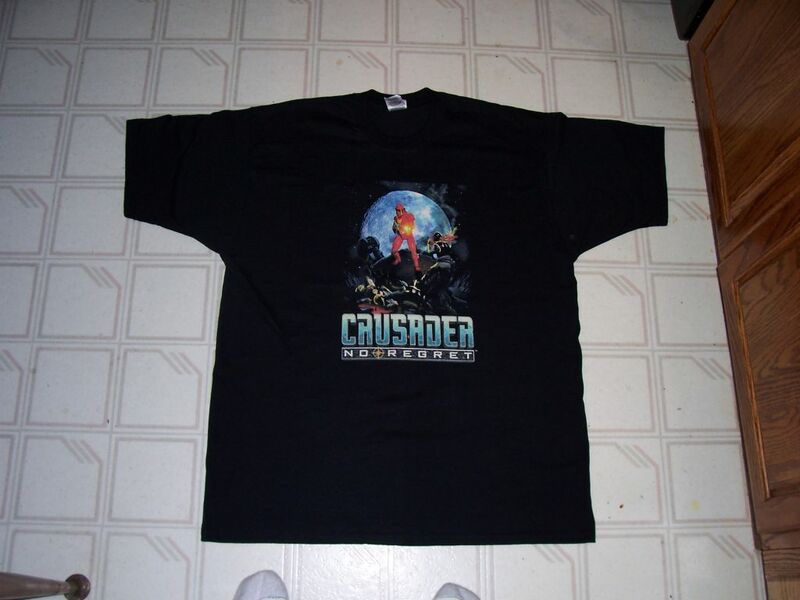 High res shots of the front and back of the shirt are also up. 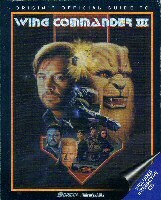 Not only was the UK robbed when it came to the theatrical release of the Wing Commander movie, but fans have also been without a DVD release all this time. Fortunately Fox has decided to right this wrong, and released the movie on DVD in to British stores on January 3. You can now find it for sale for around £12.99. If you want to order online, the cheapest we could find was the newly launched Amazon Jersey's £7.25 (plus £1.24 postage, only available within the UK). If you prefer VHS for some strange reason, your only options are still to try and track down an ex-rental copy or tape your own next time the movie shows up on BBC2. 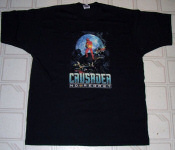 It's pretty exciting that random Wing Commander items are still being released. Pedro has already received a copy and has prepared a mini review. I'm enjoying the movie a lot more this time around, here in the UK we never got a cinema release, all I've seen before is a UK VHS squished in certain scenes and US DVD of unbelievably low quality, this was like an answer to my prayers having access to a home cinema whilst home from uni and such a high quality wing commander DVD... Anamorphic wide screen, single layer however there are no special features and only one audio track, the movie takes up the entire layer and this is clear from the very high quality picture. Audio quality is superb, especially the base, put the volume up to full and it really got my heart racing. True 5.1. Special effects are incredibly vivid. Sounds great. We was talking about surprises earlier this week, but we didn't expect one within a few days. 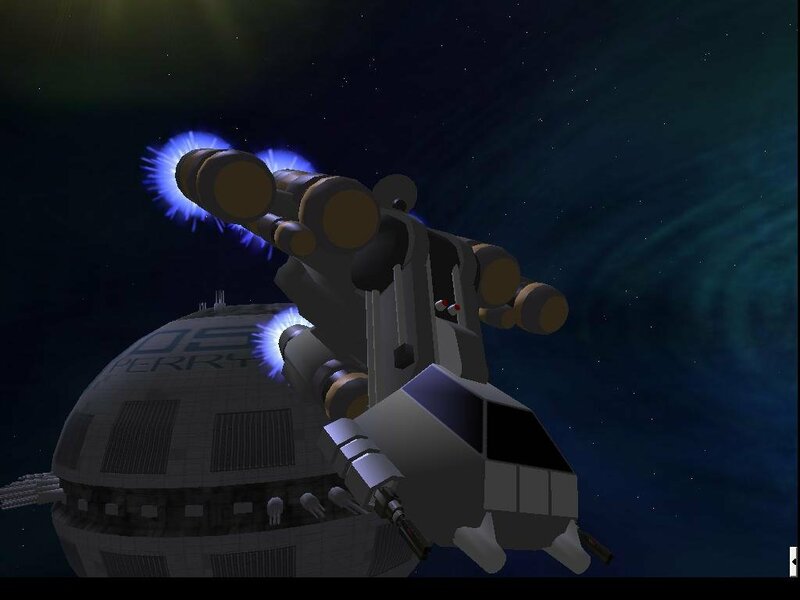 Everyone's favorite Freelancer & Dungeon Siege site, Lancers Reactor, has reported a bit on the accidental creation of a base designed like the TCS Midway. Its creator, Aldebaran, thought he was making a Star Wars ship, so now his creation isn't useful to his current project. This set of files is mainly useful for mod teams, as the actual files can not be automatically applied to the game. However, it would be a shame to see it go to waste so I have uploaded it here in case any of the other mods out there would like to use it. 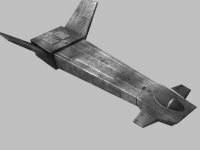 The CMP includes hard points for it to be a dockable base but no other hardpoints, so if you want weapons, lights etc... or even to turn it into a flyable ship, I am afraid you will need to add those yourselves. You will also need to build a SUR file for it as well as I never got around to building one for it. 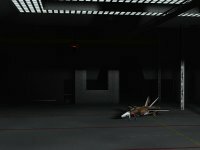 LancersReactor is hosting the CMP and MAT files here. Slashdot is running a pretty funny article about UO players donating towards Tsunami Relief. Crazy Joe has houses set up on every server in Ultima Online to accept the donations. You can take your character to the houses to donate your gold in-game. He's raised hundreds of millions of gold which in turn can be converted to thousands of dollars. That's an interesting way to do it. I'd naturally be suspicious, but Crazy Joe is a Stratics administrator and indications are that this is legit. I love volunteering at Stratics, they will not doubt hang me if I was scamming. Electronic Arts/Origin Systems Inc. are very much aware of what I am doing, I personally spoke to Anthony "Sunsword" Castoro about it. I am positive if they caught wind this is a scam, all my accounts would be closed. Too bad we can't donate virtual credits earned hauling Brilliance or fluffy rodents to Troy. The webcam was a popular feature at least year's DragonCon. 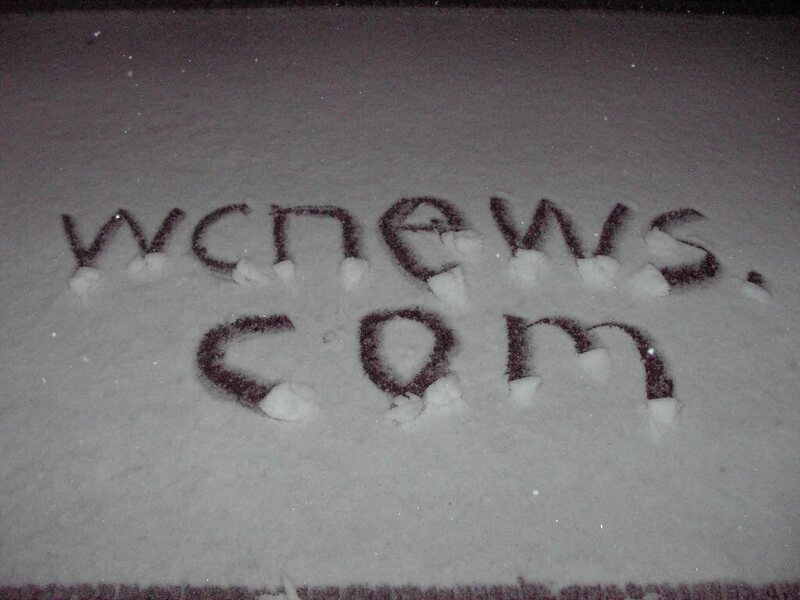 We've saved a few miscellaneous shots and archived them in our DC Gallery. Now that it's 2005, it's not too early to think about attending this year's convention. There are only 240 days left! If the average attendee started saving $60-90 a month, the trip would be paid off in advance. If you purchase your convention pass by February 15, it's also $50 compared to $85 at the door. You can find more webcam shots here. Don't forget about our Convention section as well. Some sites like to celebrate the good work done in the past year, but GamePro has instead chosen to give EA the dubious honor of achieving the #1 gaming low of 2004. As well as closing Origin Systems, EA managed to make even more people jobless by moving Maxis. Their other business moves include destroying any competition for their NFL titles by signing exclusive rights, and buying up a large portion of major France based competitor Ubisoft. Fighting back against the company, a number of EA's employees are currently pursuing a lawsuit over unpaid overtime expenses. No company has been more successful this year as painting itself as an evil gaming empire. Nevertheless, their 2004 financial data should be better than ever. It'll be interesting to see where they go in 2005. You can find the full write-up as well as the other 19 gaming lows here. 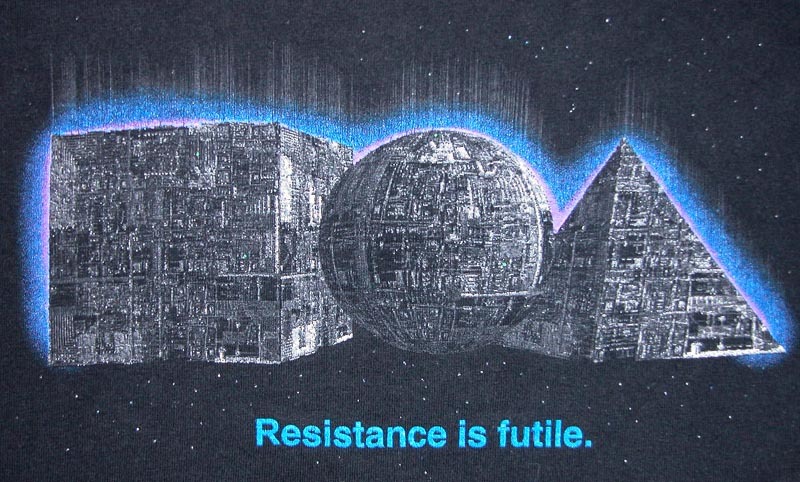 When this graphic was first made, who would have thought Star Trek would actually make a Borg Sphere and global powers would have to flex their might to defend against Electronic Arts? Wedge noticed that Team Fat's Wing Commander Surf Theme has been profiled at the classic video game music site OCRemix. There is a bit of commentary on the preview's CES origins here. It really is a fun preview track. You can find the latest update on the rest of the reorchestration project here. 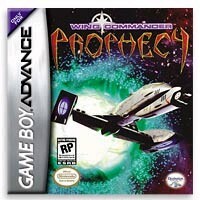 I've noticed that a number of previously sold out locations retailing Prophecy Advance have recently restocked. Last year at E3, the game's publishers told us that Prophecy continued to sell well, but at the time retail stocks seemed to be dwindling. Most notably, Electronics Boutique has gotten additional quantities and is pricing them at only $14.99 in the US. You can put your zip code in here to see if local stores have it in stock. BuyRite comes in second at $17.99. Fry's stores continue to receive new copies, and their online store sells the game for $19.99 to match Amazon/TRU's price. Kaybee continues to be sold out, but some of the smaller sites such as Game Universe, GameZone and Game Asylum still have copies. 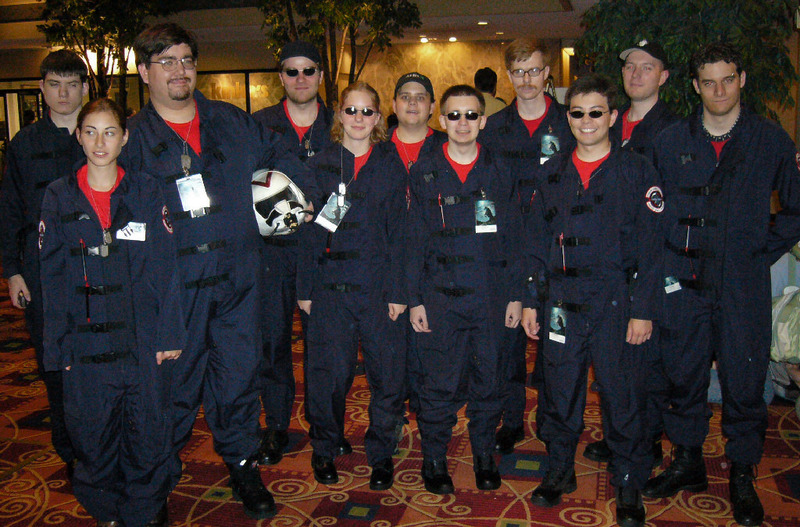 For Tuesday we'll planning a special webcam feature for DragonCon 2004 with some funny new pictures. Have a nice day. Cyberion has been doing some freelance work for the Holding The Line guys. This 1280x960 wallpaper weighs in at about 1.2 megabytes. I've created a new wallpaper for the Wing Commander Universe. 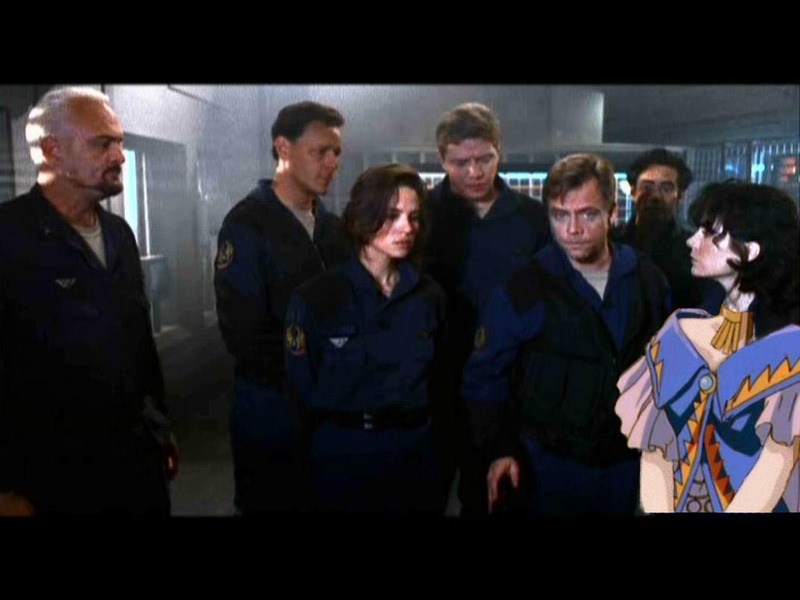 It's based on the WC Prophecy's Timeline and shows the Nephilim fleet's exodus. Originally I was creating a battle scene for one of the Holding The Line's chapters. But it turned out that it could be a nice wallpaper. I'll create more battle renders for HTL community and website and if Raptor (the guy behind the HTL) allows me, than i'll make a wallpaper from every battle scene for your pleasure folks. 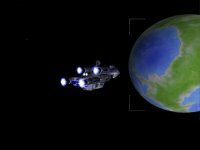 More wallpapers inspired by Wing Commander, Freelancer and other game universes can be found in his gallery. Happy New Year everyone! The last year has been great for us here, and hopefully 2005 is even better. We've seen many new faces and reported on a number of neat things. Visits to our front page jumped from 470,000 to 676,000 compared to 2003, and we served about 9 million pages compared to 6 the previous year. In the last thirty days people have downloaded over a terabyte of data from CIC servers. Our big birthday bash in August showed similar growth, and just a few days ago we posted our 6000th regular news update. The last year was also amazing for fan projects and mods. 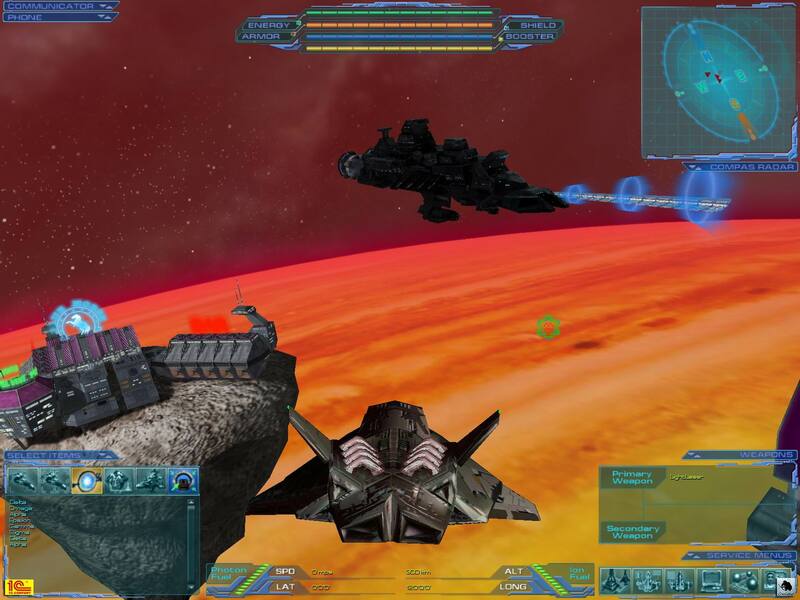 Flight Commander and Standoff were released, and the Privateer Remake and WC Saga are virtually complete. Each year we also end up with a few surprises, and I'm very excited to see what will happen next. It's sort of tradition to ask people what kind of year it will be for Wing Commander. With so many fan projects either finished recently or just weeks and months away from release, things are looking up. Our population is growing and we're eagerly awaiting the surprises in store for the new year. Todd Marshall won our Sidekick poll by a wide margin. Previous polls can be found here.